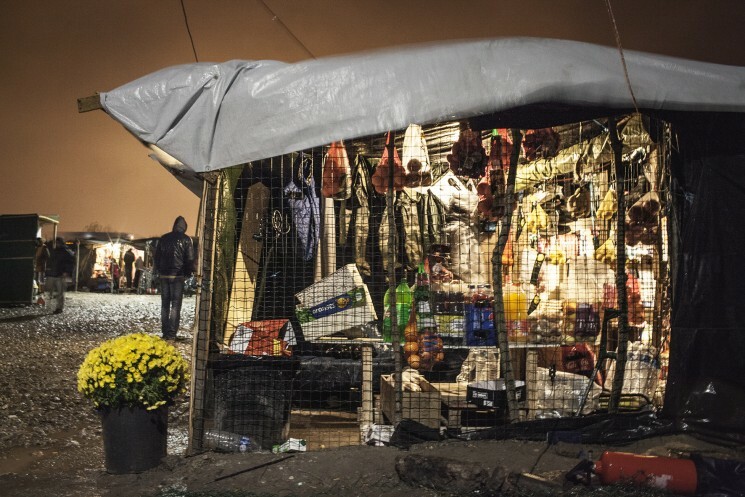 This guest blog is written by Rob Pinney, one of the photographers who submitted photos for our exhibition, Call Me By My Name: Stories from Calais and Beyond, which is at 28 Redchurch Road, London, until 22 June (details here). 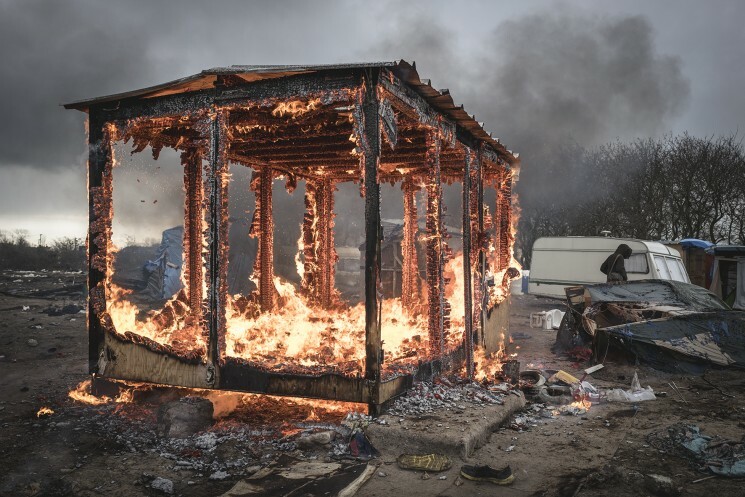 Rob’s book, The Jungle, is on sale at the exhibition and from his website (see below) with all profits going to charities working in Calais. 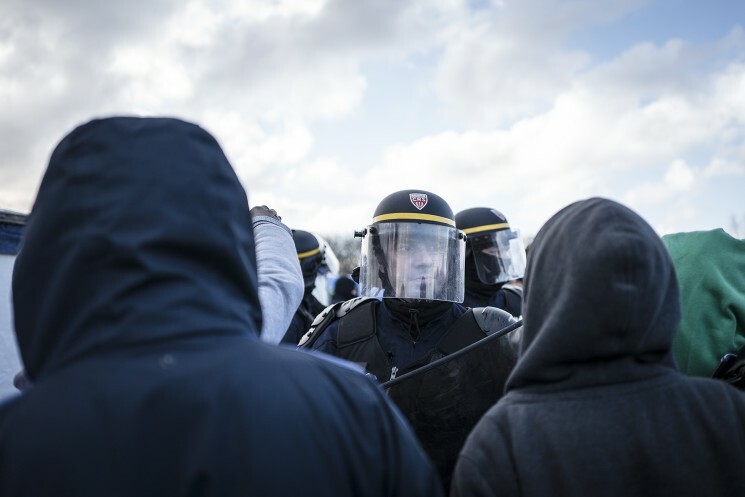 As the main point of departure for sea and rail travel to Britain, the coastal town of Calais in northern France has become a ‘hotspot’ for asylum seekers hoping to build a new life in the United Kingdom. 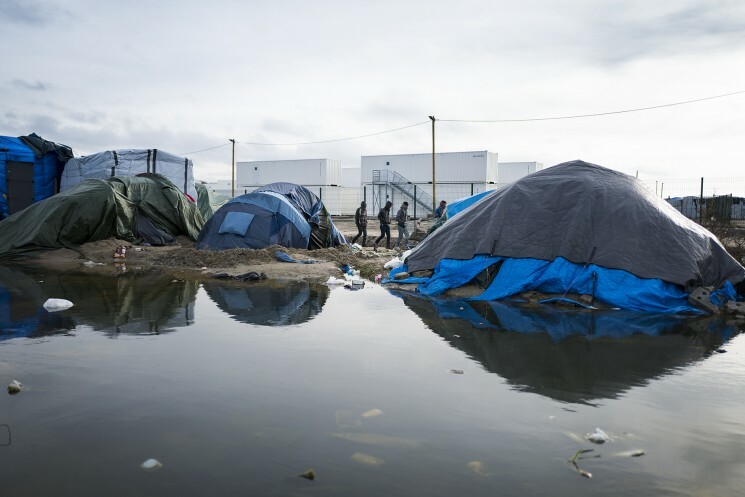 ‘The Jungle’ — the term used to refer to the shanty town settlements that have become synonymous with Calais — has no fixed location. 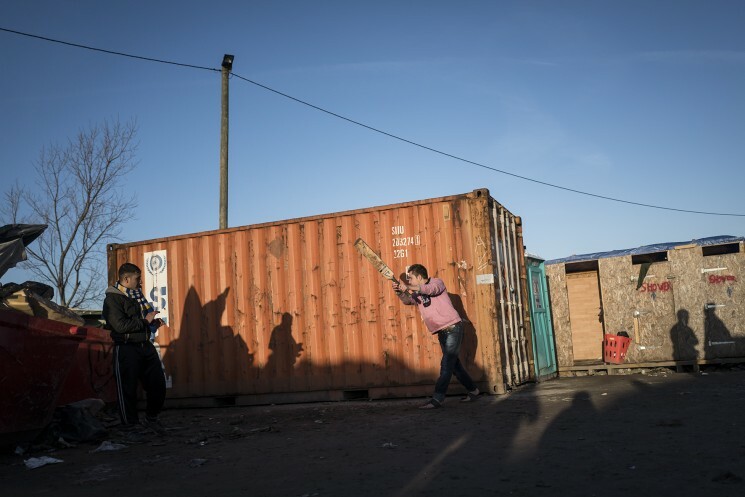 But it is most commonly associated with a former landfill site not far from the ferry port that at its peak during the 2015 refugee crisis held a population of some 8,000 people. The political discourse around the jungle and those temporarily seeking shelter there thrives on generalisations. Labelled a ‘swarm’ and a ‘bunch of migrants’ by British Prime Minister David Cameron, in the eyes of many the people here are not individuals but a collective mass — the object of a confused war of words: ‘refugees’, ‘asylum seekers’, ‘economic migrants’. The reality is far more complicated. Many have fled war and political persecution. Others, notably from Afghanistan and Iran, left to avoid being made to fight for a cause they did not believe in. Many will show you photographs on their mobile phones of family already living in the United Kingdom, whom they hope to join. And some have spent years, occasionally decades, living and working in the UK, only to find themselves suddenly ejected. For them, the journey is not one of migration but a return home. ‘What is it like?’, often asked, is a simple question that defies an equally straightforward answer. Unlike the epic photographs of Zaatari in Jordan, whose orderly lines of identical shelters extend outwards on a vast scale, the Jungle follows no such logic. The Jungle is a city. 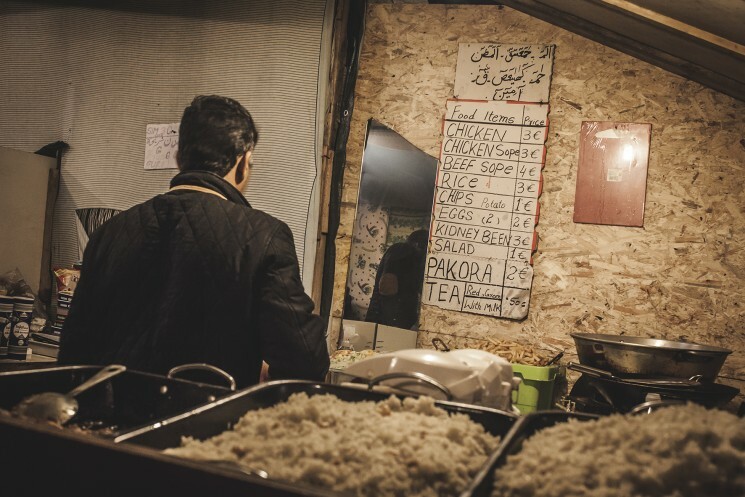 Alongside countless tents and shelters, nestled into any and all available space with little regard to order, stand shops, cafes, restaurants, hairdressers. While different nationalities have generally grouped themselves together — as is common in any city — these lines are also frequently transgressed by a shared political precarity that unites its citizens. But above all, the Jungle is a city that is constantly changing. Some of these changes are internal and organic, but others have been the result of more profound changes in the political landscape in which the Jungle is deeply embedded, and yet over which it holds no control. While cameras are a common sight, they are treated with great suspicion. Many people are wary of being photographed: some fear it may endanger their families should news of their escape reach home; others worry that evidence of their presence in France may be used against them should they eventually claim asylum in Britain; and others still feel ashamed of the situation they now find themselves in and do not want it immortalised in any resulting pictures. It is not difficult to create photographs that evoke misery and suffering in the Jungle. And while such pictures might fit with what we think documentary photography ought to look like, such images usually take recourse to particular visual tropes and do little to deepen public understanding of a complex place at a time when greater understanding is so sorely needed. At the same time, it would be wrong to beautify what remains an utterly deplorable situation that exists not out of necessity but because of broken politics. The photographs presented here are drawn from a much larger collection that spans four trips over six months. This selection is tempered by conversations I have had with some of those who live there about photography and the representation of the Jungle in the media. One friend from Darfur lamented the way in which many photographers came simply to ‘make their own business’. While I hope that the time I have spent volunteering on each of these trips is sufficient in his eyes to keep me out of this category, I also hope that the images here are seen as ones that are sensitive and respectful towards the issues so frequently voiced by the Jungle’s people. There are no portraits, nor any identifiable faces. In their place, I have tried to show traces of the many lives that are now collectively on hold. The impression left may be one of a desolate, depopulated landscape. But the reality couldn’t be further from that: beyond the edges of each frame is a vibrant and dynamic city in the making. Rob Pinney is a documentary photographer and researcher with a particular interest in war, post-conflict, displacement and migration issues. His project in Calais is ongoing, a portion of which is now available as a book, The Jungle, available at Call Me By My Name. To see the full series, visit his website. His Twitter handle is @robpinney and his Instagram account is @rob.pinney.